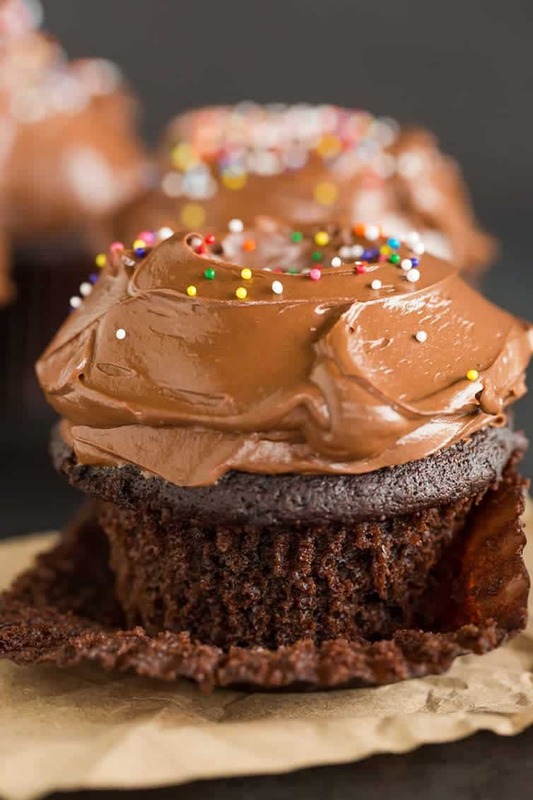 These are the BEST chocolate cupcakes – a moist chocolate cupcake recipe made from scratch with a chocolate ganache center and dreamy chocolate frosting. 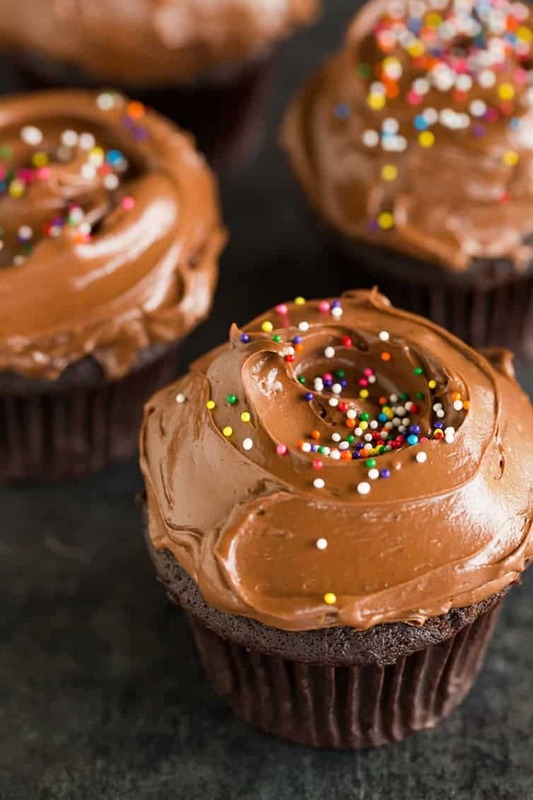 I have shared approximately one billion (actually, 40) cupcake recipes over the years, but this is the ONLY chocolate-chocolate version you’ll find. 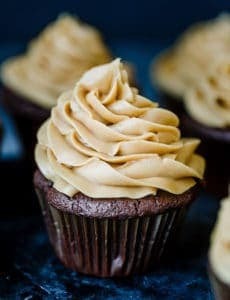 I’ve had some chocolate cupcake bases, but those were topped with things like peanut butter frosting, espresso buttercream and salted caramel frosting… then there were the faux Hostess cupcakes, the black-bottom cupcakes and the vegan chocolate cupcakes. 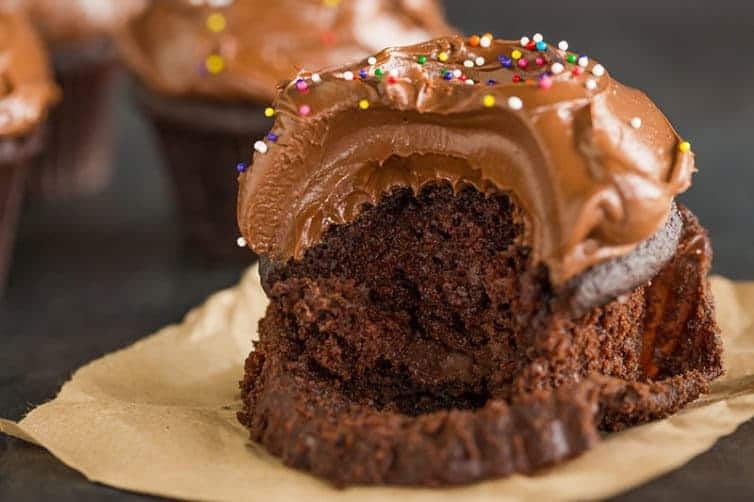 They are all amazing cupcakes, but when you need something fabulously rich and overflowing with chocolate flavor, this recipe is absolutely IT… done and done. I use this recipe anytime I want chocolate cupcakes; I’ve never even been tempted to try other recipes since finding this one. First things first – the cake part of these cupcakes is phenomenal. It’s often times hard to find a cupcake recipe that not only domes perfectly when baked, but is also moist and tender inside (not dry and crumbly). These are all of that and more; they totally melt in your mouth. 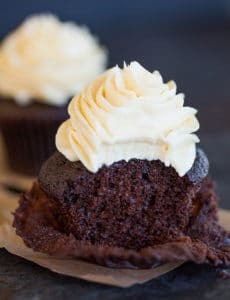 To enhance the flavor and the moist texture, a dollop of chocolate ganache is placed on top of the cupcake batter before they are baked. It’s an optional step and you can make the cupcakes with out it, but I highly, highly recommend it (obviously, ha!). And oh my, the frosting. It’s almost beyond words. Satiny smooth, buttery, just sweet enough and oh-so-chocolatey. I could (and did!) eat it with a spoon. Piled high on those cupcakes, it’s the perfect frosting-to-cupcake ratio for me. I do the whole “go big or go home” when it comes to frosting on cupcakes; no wimpy swirls here, only big, billowy mountains of chocolate frosting. The way things were meant to be. The recipe calls for bread flour, which has a bit more protein than all-purpose flour and helps to keep the cupcakes stable enough for the ganache filling. I always use bread flour (even if I omit the ganache filling, which I do at times), but some readers have reported success using all-purpose flour, as well. It’s important not to chill the ganache filling for too long, or it will be too firm and dense, and will sink to the bottom of the cupcakes (see evidence below!). It will still be there, and still be delicious, but will be firmer and lower in the cupcake than intended. 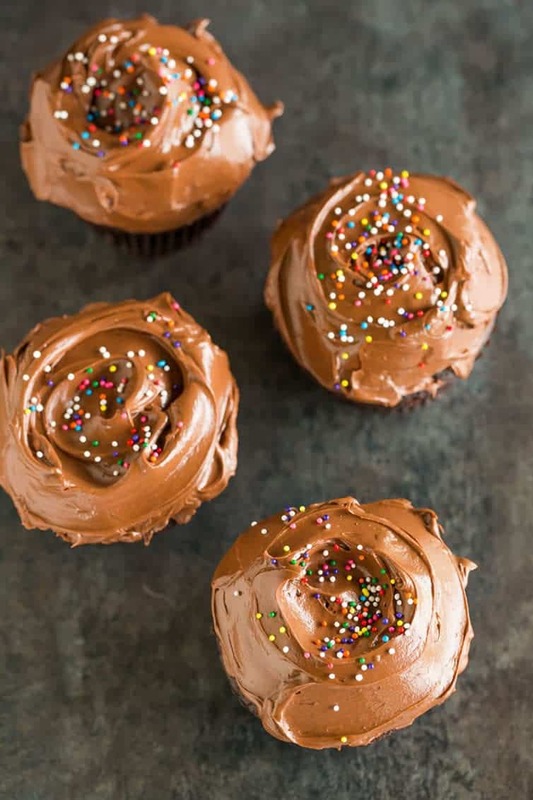 This is probably the most fabulous chocolate frosting I’ve made and have used it in a number of different recipes; it has corn syrup in it, which turns a lot of people off. I beg you to try it, but if you don’t like or don’t want to make it, then might I suggest my chocolate buttercream frosting. It’s totally different, but would be my #2 option for you. Do you Need Gluten-Free Chocolate Cupcakes? My daughter made these, at 11 years old. We made them, with gluten free baking mix, but otherwise followed the recipe and boy were they beyond delish. Just the right consistency in the cake, and the ganache in the center was a lovely addition. She shared them with our friends, and has been commissioned to make some more for them, as they have to eat gluten free…and rarely get such a delicious dessert. Well done! ~Gretchen A. This coming Sunday is Mother’s Day and I know everyone is clamoring for light, bright, spring-y desserts loaded with fruit, and I have a couple of those coming for you this week, but if your mom (or grandma, aunt, sister, wife, or whoever you are celebrating on Mother’s Day) is a chocolate lover, you can give her no better gift than these amazing cupcakes! 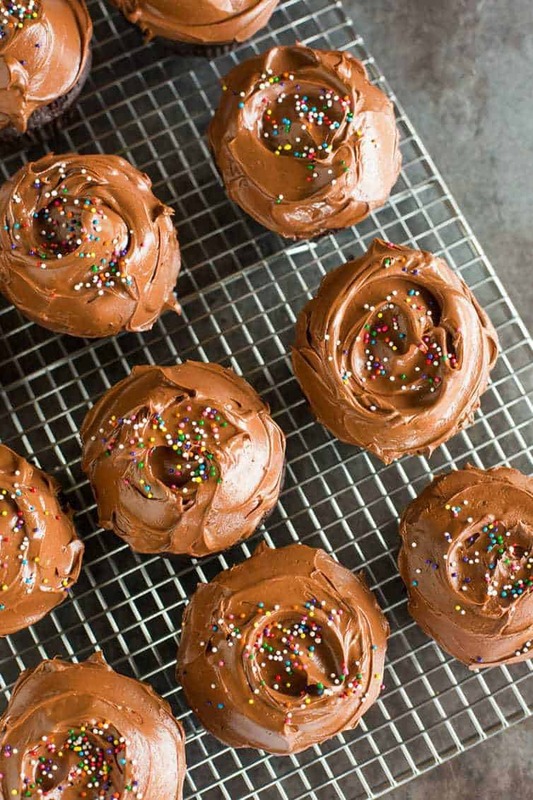 These cupcakes are a chocolate-lover's dream! Make the Ganache Filling: Place the chopped chocolate, heavy cream and powdered sugar in a small bowl. Heat in the microwave on high power until the mixture is warm to the touch, 20 to 30 seconds. Whisk until smooth, then refrigerate until just barely chilled, no longer than 30 minutes. Divide the batter evenly between the muffin pan cups. Place one slightly rounded teaspoon of ganache filling on top of each cupcake. Bake until the cupcakes are set and just firm to the touch, 17 to 19 minutes. Cool the cupcakes in the pan on a wire rack for 10 minutes, then remove the cupcakes from the pan and place on the wire rack to cool completely, about 1 hour. 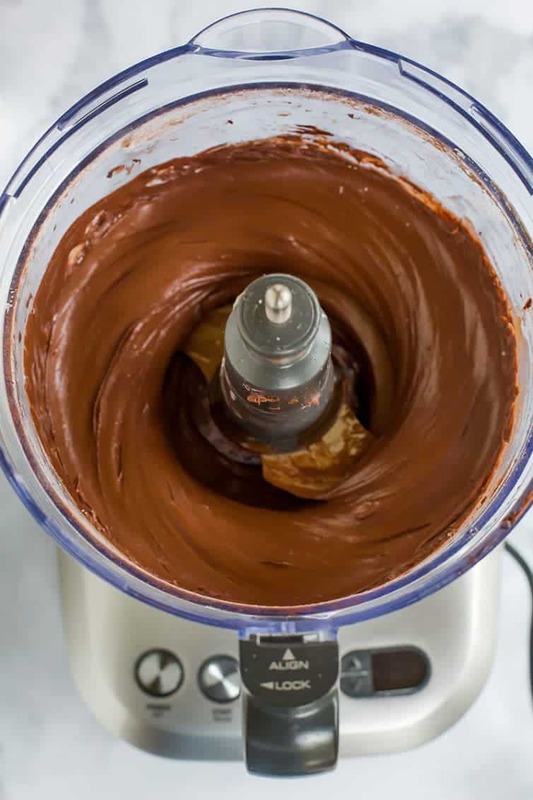 Make the Frosting: In a food processor, process the butter, sugar, cocoa powder and salt until smooth, about 30 seconds, scraping the sides of the bowl as needed. Add the corn syrup and vanilla extract and process until just combined, 5 to 10 seconds. Scrape the sides of the bowl, then add the melted chocolate and pulse until smooth and creamy, 10 to 15 one-second pulses. Frost the cupcakes as desired. The frosted cupcakes can be kept in an airtight container at room temperature for up to 3 days. The ganache filling can be omitted it if you'd like a more traditional chocolate cupcake. The frosting can be kept at room temperature for up to 3 hours before using, or refrigerated for up to 3 days. If refrigerated, let stand at room temperature for 1 hour before using. This recipe was originally published on August 20, 2013. Hello! Your cupcakes look so good! I tried to make some today, though when I baked them, it seemed almost like the ganache kinda half slid off the cakes and became a toffee-like consistency on the baking pan. I found that cooking them for 5 minutes and then adding the ganache kept it near the top. Can i replace the Dutch-processed cocoa powder with regular cocoa powder in this recipe? Hi Jamie, For this recipe, Dutch-processed cocoa is necessary to ensure a proper rise. I was looking for your Vegan Chocolate Cupcake recipe as I used it about six years ago and loved it. However, I am unable to locate it and the link keeps sending me to this recipe for the Ultimate Chocolate Cupcake. Please, please, please help me!!!!!! Thank you in advance. I am not a chocolate cake fan at all, and I must say these were absolutely divine! I used a cream cheese frosting with them, upon request which complimented them beautifully. I also didn’t try the ganache filling, but definitely will. Can this filling be added after you bake the cupcakes, so I wouldn’t have to worry about it sinking? If anyone is looking for the perfect chocolate cupcake you found it! Hi Sarah, I’ve never tried adding the ganache after the fact, but I don’t see why I it wouldn’t work. So glad you enjoyed them! I’m not seeing the ganache on the pic of the inside/ does it blend in? Can I make this a cake? And if yes, what size pan do I use? 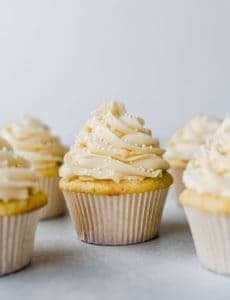 What would be the baking time if I wanna make mini cupcakes instead of regular cupcakes? Hi Karla, I would start checking around 8 minutes. Enjoy! My only cupcake recipe….made for every ocassion including birthdays, showers, weddings. My most requested recipe. I cook the cupcakes without the ganache and, when they are cooled, make a hole on each cupcake to put the ganache in ……just like having a truffle surprise. These freeze really well and taste just as good out of the freezer as when they went in….several months later. They have enough chocolate flavour that mini cupcakes are good as well…..just watch the baking time. This frosting is excellent, as well, on a white cake. The frosting and ganache an freeze too. Is it possible to use glucose instead of light corn syrup? I have not tried that, but I think it could work! Have you made this in a cake rather than cupcakes? Sounds delicious but I’m needing a new chocolate cake recipe and wondering how I would adjust this. So…I made these cupcakes again, from just last night, because I wanted to try them using semi sweet chocolate chips (last night I used dark chocolate chips), and I wanted to leave out the ganache. These are WONDERFUL!!! My new “go to” recipe!!! Yay!!!! My question: as this recipe makes 12 cupcakes perfectly, can I double the recipe in the same bowls to make more?? Thank you! I was intrigued with this recipe because I have never made a cupcake with vinegar, or ganache baked inside. This recipe may very well become my “go to” for chocolate cupcakes. The flavor is deep and rich. So is the color. Dense, but still light. I baked with all purpose flour, not bread flour. Still came out great. (I suppose bread flour would have changed the texture, but these were just fine in my book). One thing: next time, I won’t bake the ganache in the cupcake as the recipe gives as an option. The ganache kind of sunk to the bottom and ended up on the bottom of the paper liner. I think the cupcake stands alone and would be great with ganache or buttercream on top. I didn’t frost them this time, as I just wanted to test the recipe. I will make again, frosted with buttercream, or even dipped in ganache. These sound fabulous! I’d love to try this frosting but don’t have a food processor. Only blender and kitchen aid mixer. Would either of those work? Thanks. Hi Christy, Yes I would use the mixer! Is this frosting stiff enough to hold a design if piped? Hi Monica, I’ve used it to pipe frosting on top of cupcakes, and it holds the swirls just fine. Not sure what exactly you had in mind? Great cupcake. i baked it, took out a plug and filled with some chocolate mousse. topped with whipped ganache. My family has named these their new favorite chocolate cupcakes, and they have had “suffer” through several recipes. Thank you for this one. I have never eaten a chocolate cupcake that I’ve actually enjoyed…until I made these! They truly are the ultimate. Now, I would choose one of these over most any cake! I ended up using all purpose flour because that’s what I had and the texture was spot on. Mine sunk slightly but I’m baking at high altitude so I will try them with the bread flour and see if that helps with the rise. I also omitted the coffee because of a religious belief and used hot water instead. Thank you for a delicious cupcake. My husband and kids loved them and you have forever changed my mind about chocolate cupcakes!! Have you tried baking this batter as a layer cake? I made these tonight for a Christmas Open House at my in-laws’ place. Before my rant, please note these came out excellent and I got lots of compliments. The cupcake was very moist and flavorful. ‘Ooh’s and ‘Aah’s abound at the ganache filling. I used peppermint buttercream frosting with Andes peppermint baking chips mixed in instead of the chocolate frosting, because Christmas. Also this recipe gave me a good excuse to use some of my bread flour. See below for my minor complaints.I was a little frustrated with the chilling recommendations for the ganache and the coffee / chocolate mixture, as I felt I was going to ruin something if either were left in the fridge too long or taken out too early, causing me a bit of anxiety during the process. I’m not totally experienced with filled cupcakes, ganache, or using coffee and melted chocolate in cake batter, so I felt a bit ‘in the dark’ while running through this recipe, as there’s not much explanation.Hindsight being 20/20, I’ve determined that the goal with chilling the ganache is getting it to solidify enough so it will hold shape when scooped up and plopped on top of the batter. So if anyone has their own ‘hack’ for creating little perfect balls of ganache that will sit just right on top of the batter, use it and share with the rest of us please. If the blobs of ganache aren’t perfectly in the middle, they will leave large openings at the top of the cupcake. If you’re good at piping frosting you can just cover it up, but I’m not, so it ends up looking a little sloppy. I just need a better way of getting the ganache out of the bowl, into a small round blob, and then dropped perfectly in the middle of the batter.Peppermint buttercream recipe: 1/2 cup softened butter, 1/4 cup vegetable shortening, 1/3 cup granulated sugar, pinch of salt, 1/4 tsp peppermint extract, 3 cups powdered sugar, 1/4 cup heavy whipping cream, 1/2 cup? of Andes peppermint baking chips. Whisk the butter/shortening until fluffy, add sugar, salt and extract, mix until blended. Add powdered sugar 1 cup at a time, beat well after each addition. Turn mixer to high, slowly add cream until the consistency is right, adjust more or less. Mix in the Andes peppermint chips, adding until it looks right (I didn’t measure). The chips provide a nice little crunch (think mini chocolate chips, only peppermint flavored). One person commented the frosting was too sweet, so maybe omit the 1/3 cup granulated sugar if you’re worried about it. I’ve made this recipe multiple times and my husband loves them!! I’m thinking I’ll make them for Thanksgiving this year, but was wondering if I could double the recipe? Or do you recommend one batch at a time? Hi Lindsey, You can double it!